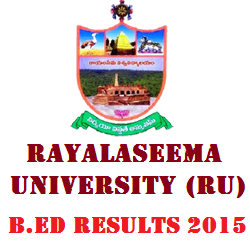 Rayalaseema University B.Ed Results 2015 announced. RU B.Ed Regular and Supplementary Results 2015. Rayalaseema University combined B.Ed College B.Ed Annual Exam Results are announced by Vice Chancellor Y. Narasimhulu and Acharya NTK Naik, Deen of Examination Branch. Total 4,043 students were appeared for the Examination in which 2,868 students were got passed the examination, in which 1,171 Boys and 1,697 girls were passed, District wise 70.94% pass percentage is recorded. Rayalaseema University, Kurnool, came into existence, fulfilling the long-cherished dream of people of Kurnool district in the year 2008, by Act No. 29 of 2008 enacted by the Legislature of the State of Andhra Pradesh and published in the Andhra Pradesh Gazette on 24 September 2008. Prior to this, the University was formally launched by the G.O.Ms. No.89, Higher Education (U.E.II) Department, dated 25.06.2008. The Establishment of Rayalaseema University is part of the vision of Government of Andhra Pradesh to promote access, equity, and inclusiveness in Higher Education. We are here below providing the RU B.Ed Annual Exam Results 2015 here to check online. you can get the Results using your Hall Ticket No. which is allotted to the student at the time of the examination.